IDX is an important component of a Realtor’s website. Providing the capability to search for homes on your website is a valuable resource to your website visitors. A Realtor’s website without IDX, is like a car without seats. It’s nice to look at and it technically works, but once you find out what is missing, you’re going to want to ride in a different car…and use a different Realtor’s website. IDX is short for internet data exchange. An IDX service allows website visitors to search MLS listings directly on a Realtor’s website. People land on Realtor websites for two main reasons. One reason is that they are looking for a real estate agent. And the other reason is to search for properties. IDX takes care of the second reason. IDX provides value to your visitors, some of whom are your existing clients (gotta take care of our existing clients too, right?). Visitors to your website can search for homes they are interested in, research the market, or just snoop on what is for sale in their market. IDX is an inexpensive way to provide value to those people. Without the property search function on your website, these people will go to some other Realtor’s website, or even Zillow. The benefit of IDX over Zillow, is that most IDX update their information as often as every hour. IDX can provide SEO benefits to Realtors’ websites. When people search for a property using an address or MLS number, websites with IDX can show up in the search engine rankings page (SERP). Zillow, Trulia, Realtor.com, and some other major websites may appear in the top spots along with some real estate agents’ websites, but at least IDX gives you the chance to be up there with them. There are two primary ways that IDX services provide MLS listings to websites: frames and wrappers. We won’t get into too much technical detail, but we do want to quickly explain the difference. Frames are a way to show another website (the IDX provider) on your website. Your website isn’t actually getting the SEO benefits, because the IDX provider is. IDX using frames are not ideal for your website. Wrappers put the information from the IDX provider right into your website, so search engines give your website the SEO benefits. IDX using wrappers are the much better option. Be sure to ask your IDX provider if they use frames or wrappers to display property information on your website. If they say “frames”, then keep looking. Websites from Agent Sidekick use iHomefinder as the IDX provider. iHomefinder uses wrappers on the websites that we provide to give our clients’ websites the SEO benefits for property searches. iHomefinder also has customizable title tags, meta tags, and permalinks, which we configure for our clients, providing additional SEO value. Remember when we said earlier that there are two primary reasons that people go to real estate agents’ websites, and that one of those reasons was to search for properties? Sure, a lot of people using the IDX on your website are voyeurs, looky-loos, and curious neighbors. But a majority of people are people interested in buying or selling real estate. That means a lot of people searching for properties on your website are very good potential leads. They are “potential”, because they don’t have a Realtor yet. You could be missing out on attracting them to your website if you don’t have IDX as a reason to visit and stay on your website. Most IDX services have a way to contact the Realtor directly about the property they are viewing on a website. iHomefinder has this function. And most good website developers can set this up, as well as other ways to contact you through the website. Agent Sidekick can sets this up for our clients. You want these website visitors to contact you. These are good leads. They are on your website and searching for properties. These are some of the best leads in the real estate industry. IDX is critical to ensure you have the opportunity to get these leads. Quality IDX services also have additional valuable functions. Users can search for properties using an interactive map, Realtors can create predefined searches that are applicable to their target clients (providing additional SEO value), Realtor’s own listings can be highlighted, users can save searches, and so much more. 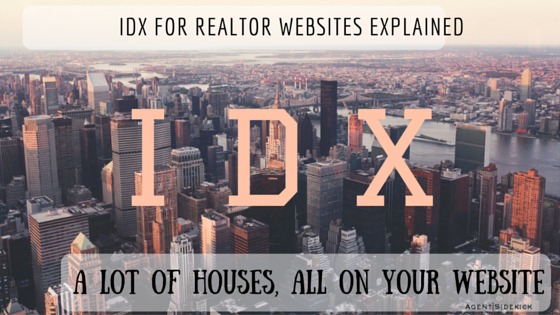 IDX is an important utility for any Realtor’s website. It provides value to visitors, and it helps to generate good leads. A flute with no holes, is not a flute. A donut with no hole, is a Danish. And a Realtor’s website without IDX, is just a document. Ok, so maybe I took some artistic license with that last part about the Realtor’s website, but Chevy would have included it if the internet was around in 1980. If you are interested in IDX for your website, Agent Sidekick can help guide you through your selection process. Or, if you are interested in getting a website with IDX already included, Agent Sidekick can build one just for you.